What is "Gymnastics by Design"? Gymnastics: an artistic activity and sport, involving performance of exercises requiring physical strength, flexibility, agility, coordination, balance, and grace. Design: to plan something for a specific role or purpose or effect; a decorative or artistic work, with purpose; an anticipated outcome that is intended or that guides your planned actions; intend or have as a purpose. Simply offering a place where respect, responsibility, kindness and truth are earned, learned and reinforced. This is done while having fun and doing gymnastics. We encourage nearly forgotten skills such as patience and forgiveness. The words "Common Sense" are hardly ever heard anymore. Good sense is no longer common; it must be taught, learned, and practiced. Spirit, Mind, and Body, must be one in truth and understanding. With gymnastics as a base, this program offers exposure to a positive environment that facilitates a chance to grow in a healthy direction. We hope you find this a benefit to your child's mental and physical strength in today's competitive world. Yes, this is a school of gymnastics. Progression in gymnastics is based on ones physical and mental abilities. These abilities will be recognized and utilized with the child's best interest in mind. Some children can spend several years in each level. Every child is different, so friends or siblings may not progress together. Placement in classes is such, to challenge a child yet allow for achievement. With health and safety in mind gymnastics may not be the ideal long-term sport for everyone. However it can be a benefit for all if done properly. The basics of gymnastics have been proven to aid athletes in other sports of choice. 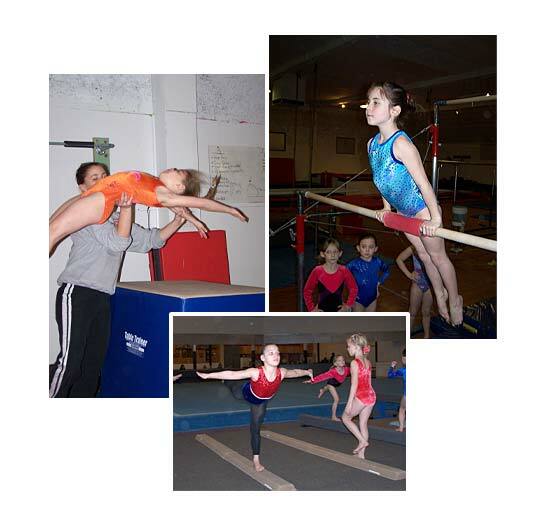 We at "Gymnastics by Design" strongly encourage parents to leave the coaching to us. Allow the child to grow in the sport/art as natural as possible. Your coach will address the proper training methods for each child as an individual. A child must want to be here. Therefore we attempt to make their visit as fun and exciting as possible within the boundaries defined by safety and the learning environment. God bless and Happy Handstands! Tuition is payable before the first of each month. Please make sure your student's feet are clean. Shoes should be worn to and from the gym. For your safety, no parents or siblings are allowed in workout/gym area. All visitors are to remain in seating or play areas. It is tough, we know, but please leave the coaching to us. Refrain from shouting helpful hints across the gym. This is distracting to everyone and may cause injury. If food or drink is brought into the gym, take it with you when you leave. Also, please clean any mess that was made. We do not maintain a "lost and found". An attempt will be made to find the owners of items left behind. After seven days, items will be donated to those in need. Thank you for your respect and cooperation. Holidays: Gymnastics by Design is closed the Thursday and Friday of Thanksgiving week and we are closed for about a week at Christmas. GBD is OPEN all other holidays/school closure days unless announced otherwise. For more information, please check the calendar. Mailboxes: Please check the black metal "mailboxes" for notices from the Gymnastics by Design office staff each time you come to the gym. Communication: To contact GBD coaches/office staff leave a voice mail at (541) 698-8182, or even better! - email us at gbd@gymnaticsbydesign.com. Tuition Policy: If tuition is paid in full prior to the first of the month, a $5 discount is applied. Tuition is Standard Rate when paid by the 12th of the month. A $10 late fee will be applied thereafter. A child may not continue class without proper payment and may be dismissed from class. Annual Registration Fee of approximately $30 per gymnast is non-refundable and must be paid each July. This fee is pro-rated quarterly for new students and is paid along with their first month's tuition.